Frank "Paddy" Slavin, "The Sydney Cornstalk." 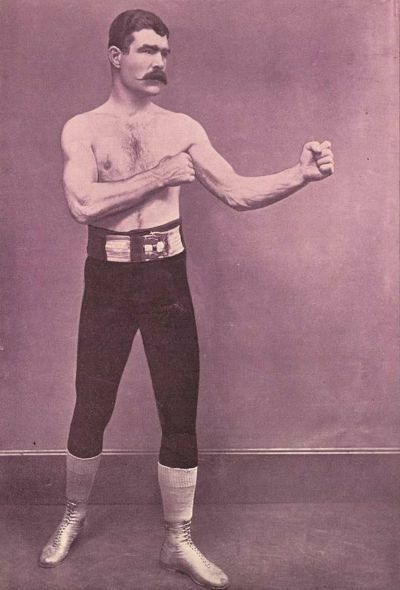 If you've ever gone through microfilm of 1890's newspapers, you've undoubtedly noticed many stories about about Francis Patrick "Paddy" Slavin, a heavyweight boxer from Austraila. "The Sydney Cornstalk" rose quickly and may have been heavyweight champion of the world had he been given the chance to fight then-current champion John L. Sullivan. Had that match occurred, and had Frank defeated Sullivan, it might be a Slavin rather than a Sullivan who everyone thinks of as boxing's greatest champion of the golden age. Slavin was born in New South Wales, Australia, about 100 miles northwest of Sydney. His birthplace is variously listed as Vacy or Maitland, which are about 10 km. apart. After his boxing career, Frank went to the Canadian Klodike to prospect for gold. It's reported that in addtion to prospecting, he also worked for a time as a lumber agent. When he was 54, he enlisted in the Canadian forces during World War I. He died in 1929 and is buried in Vancouver, British Columbia. This page is in rememberance of Frank and his family, and to celebrate his accomplishments. While Frank was born in Australia, his family's roots are in County Tyrone, (Northern) Ireland. Tony O'Grady, whose wife is descended from Rosanna Slavin O'Connor (see below), in 2007 filled me in on Frank's family. His grandparents were Francis and Anne (Kelly) Slavin, who lived near Fintona in southern County Tyrone. Francis can be found in Griffiths Valuation, renting a house from Michael Kelly. The home is in the townland of Rathfraggan, about 3 kilometers NNE of Fintona. Ask About Ireland has a free lookup of Griffith's with links to both the valuation book and maps. From those sources, I believe this Google Map shows the portion of the townland that was Frank's ancestral home. The property is in the center of the view, on the west side of Blackfort Road, to the north of the lane that goes to the southwest to the watercourse (the Carnelea?). By pulling out (clicking on the " - " in the scale on the left) you can get your bearings as to the location in relation to Fintona, Omagh, and other locations in County Tyrone or Northern Ireland. Frank's grandparents migrated to Australia during the Famine, in 1851. They had one son, Michael, who was the father to Frank and his boxing brothers, Frederick and William John Slavin. Tony stated that he has over 500 descendants of Francis and Anne in his database, and states that there could be at least one direct male line descendant living today. We would love to have the family represented in our DNA project-- if you're that man, or his son or grandson, please contact me! Frank is still remembered in Vacy. Graham Brooker of Scone, N.S.W., sent a batch of photos documenting the start and the end of Frank's life. Many thanks to Frank and his daughter Sally for getting in touch and in sharing the photos and information! Frank's birthplace. Graham shared these photos of what's left of Frank's birthplace near Vacy. Frank's resting place. While on holiday, Graham looked up Frank's gravesite in Vancouver, British Columbia, Canada, and sent these photos. Vacy today. Graham sent along these photos of modern-day Vacy, showing that Frank is still a favorite son. Frank's grandmother's gravesite. Graham also sent these photos of the headstone honoring Frank's grandmother and aunt, and of the cemetery where they rest, at Summer Hill, N.S.W. This book was a history and an appreciation of boxing, published in England in 1922. It contains a detailed description of the Slavin-Jackson fight in 1892. A chapter from the book Yukon Yesterdays , a man's memories of thirty years spent in the Yukon. The chapter talks about a couple fights Frank undertook while prospecting in the frozen north. "THE SYDNEY CORNSTALK." -- LIFE STORY OF FRANK P. SLAVIN. Frank's life story-- up through 1926, anyway-- was serialized in The Register of Adelaide, South Australia, and probably in other Australian newspapers. His story offers some genealogical information, for the most part, offers a fairly detailed look at the world of prizefighting at the turn of the 20th century. It's going to take me a while to get all 16 chapters posted, so be patient and keep checking back! Chapter I - Neighbouring farmer horsewhipped me and turned my thoughts to fighting. My first professional fight came as result of challenge in bar room. Chapter II - American fighters invade Australia. I meet Martin Costello in first international bout of its kind. Knocking out a strong man. Chapter III - Costello and I meet a second time, and the police hound us from pillar to post. Special train defeats the law. Chapter IV - I become heavyweight champion of New Zealand, fight before Marquis of Queensherry, and defeat Jack Burke. Chapter V - The last bareknuckle fight. Chapter VI - Boxing hangs in the balance, but is not found wanting. I defeat Joe McAuliffe, of America, and am arrested. Chapter VII - My only experience in matrimony. It lasts for 36 years. Margate welcomed "newly weds" with feast and fireworks. Monte Carlo got my diamond. Chapter VIII - On the trail of Sullivan. A bedroom interview with the champion. Chapter IX - My second attempt to get a match with Sullivan failed. My backer refuses permission to postpone my fight with Jackson so that I might meet the champion. Chapter X - Opening of the National Sporting Club of London, and how a bottle of Lord Lonsdale's 65-year old brandy sent me to defeat before Peter Jackson. Chapter XI - I tried to retire, but came back to regain my lost prestige. Arrested in New York. Disappointments in Canada. Off for San Francisco. Chapter XII - An April fool joke in San Francisco. Off for the Klondike. Blazing the White Pass route, Juneau wild enough for murder, but not for boxing bout. I was mourned as dead. Chapter XIII - Frank Gotch challenged me to a boxing bout. I nearly knocked his head off, and he threw me out of the ring. Chapter XIV - A frame-up that didn't come off. A fifteen-seconds' knockout; Peter Jackson and I met in Skagway; my last fight in Dawson in 1903. Chapter XV - My greatest fight of all. I swap a few punches with the Germans, and get rheumatism for my trouble, hut it was worth more to me than all my other experiences. Chapter XVI - Frank comments on the greatest boxers of his day and the current day.